I feel as though the blog as gone by the wayside. (Speaking of wayside did anyone ever read Wayside School is Falling Down? Great book.) But I guess without children and/or pets to blog about when nothing else is happening that's to be expected. I do have some pretty exciting things coming up in the next weeks. All events are sure to be blog worthy. Dinner and a Blue Jackets Game. A trip to Colorado Springs. Easton for dinner, a movie, and shopping (besides tonight's unplanned trip). The Ring Game and Combine Derby at the Fairfield County Fair. Third row seats to see the Cavs play the Celtics in an exhibition game at the Schott. Wow. Now that I think about it, I'm going to be a very busy girl. I should probably enjoy the down time while it lasts. That gives me roughly 18 hours before my life starts to pick up again. That's 14 hours to finish How I Met Your Mother Season 4, take an impromptu trip to Easton to get C new shoes (his current ones have holes in them and holes do not agree with rain) and take a trip to Art and Clay to finish some painting C and I started back in February (and haven't been back since then). Oh, and I have been cooking some delish meals lately. They just haven't made it to my blog. Stuff like Crock Pot Spoon Roast with carrots and potatoes. Roasted butternut squash which is now in two cup portions and frozen in my freezer. Beef and Noodles made with my left over spoon roast. Hungry yet? One another note is it bad for me to be happy that Chicago was eliminated from hosting the 2016 Summer Olympics solely because the Obama's and Oprah lose? Plus, how neat will it be to see the summer games held in a location that is technically in their winter season? 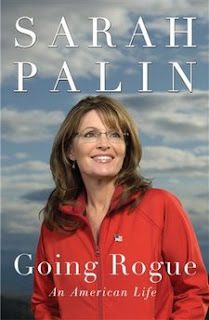 Also, what's up with Sarah Palin's new book cover? Could she not find anything better to wear? And is she even wearing a shirt under that coat? Doesn't she have some of the best clothes campaign money can buy? With that we're off to Easton and the home to finish HIMYM. Oh, we might also get flu shots and have my rings cleaned. Talk about an exciting Friday night! Tomorrow the busy life starts.